Puns, jokes, tricks and illusions are deftly employed by two artists who use humour to challenge the self-regarding pieties of Western art. Stunning spectacle: Zadok Ben-David's The Other Side of Midnight. It may be presumptuous to declare Anglo-Israeli artist Zadok Ben-David a great sculptor, but there is no denying he is one of the great entertainers in world art. What's wrong with that? Nothing at all. There is an air of sanctimony about much contemporary art, as if it were an arcane ritual to be endured for the sake of spiritual purity. If a work induces delight or pleasure or wonder, it is immediately suspect in the more rarefied quarters of the art world. But if truth be told, everyone loves a spectacle. Like one of Brecht's grimacing Japanese masks showing what a strain it is to be evil, it's hard to maintain a sour face when everyone else is enjoying themselves. The sole exception, in my recent experience, was Opera Australia's production of Orpheus in the Underworld. But when one commits to an opera ticket, there is a certain pressure to believe it was worthwhile. Art exhibitions are generally free, and subject to a wide range of responses. Think of the Anish Kapoor exhibition that recently closed at the Museum of Contemporary Art. One could imagine profound meanings for Kapoor's voids and mirrors, but most people treated the show as a funfair where the main attraction was to snap pictures of distorted reflections in the sculptures. Zadok Ben-David's The Other Side of Midnight at Annandale Galleries presents another irresistible photo opportunity. This time it is like turning a corner in a dark forest and being confronted with a natural phenomenon that would leave David Attenborough speechless. Hanging in the centre of the large upstairs gallery is a circular form composed of luminescent, brightly coloured butterflies. The gallery walls are painted black and the lighting is confined to a set of spots with UV bulbs. The apparition hovers in the air like a planet in space. 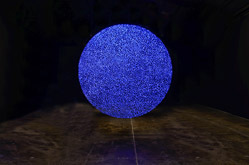 When one walks around to the other side, the apparent sphere is revealed as a disc, three metres in diameter, made from thin sheets of hand-painted, laser-cut steel. The verso is composed of a mesh made from hundreds of tiny beetles or cockroaches, in a uniform blueish-white. The title, The Other Side of Midnight, is borrowed from a 1973 potboiler by Sidney Sheldon, which was made into an equally meretricious movie. In this context, it's best recognised as a gag, playing on the larger-than-life sentiments of the pulp novel. Ben-David encourages us to see this work as something deep and meaningful, but hints that it is really all on the surface. This is echoed by the structure of a piece that gives a false impression of three-dimensionality. If you look more closely, you find the coloured butterflies are tiny human silhouettes with wings attached. Instantly, you think of movies such as The Fly. The work is not a representation of the natural world but something supernatural or magical. This emphasis on magic and illusionism is a vital part of Ben-David's work. Known as an amateur magician as well as an artist, he has never allowed gravity to become an issue. He treats mass and volume as qualities that may be conjured up in a viewer's mind while not being present in the sculpture itself. Many of his works feel as precise as line drawings and as insubstantial as shadows. He shouldn't be accused of reducing sculpture to a form of graphic art; rather he adds another dimension to drawing. The other works in this show are black silhouettes of plants and animals, sometimes arranged in the form of a human body. These smaller pieces are sold for a range of prices, while the large installation is the kind of work made for a museum or a public space. Ben-David's last exhibition at Annandale Galleries, in 2008, featured a floor installation called Blackfield, which included 6000 individual sculptures. The show broke all gallery attendance records, with more than 10,000 visitors. The current show is already packing them in, largely through word of mouth. To get such numbers at a commercial gallery when the market is at a low ebb is a notable achievement. In more doctrinaire times, Ben-David might have been criticised for his love of illusion and theatricality. In the pluralistic present, one has to admire his entrepreneurial flair and joie de vivre. If wanting to entertain is a crime against art, then Adam Rish is just as guilty as Zadok Ben-David. For almost 40 years, Rish has been making artworks that refuse to take themselves seriously. He has made paintings, sculptures and prints, although his special claim to fame may lie with the collaborative pieces he has created with artists and craftspeople from all over the world. These works are featured in a touring survey called Misanthropology: The World Art of Adam Rish, which debuted at the Orange Regional Gallery in February, and may now be seen at the Sturt Gallery in Mittagong, which is the closest venue to Sydney on a tour that encompasses Moree, Cessnock, Taree and the Gold Coast. I've written an essay for the catalogue, but that's where my involvement ends. As one may suspect from the title of the show, Rish has a passion for puns and wordplay. He can be proud of ''misanthropology'', which combines misanthropy (the hatred of people) with anthropology (the study of humanity). One thinks of those anthropologists in the field whose presence disrupts the lives of the people they are studying. It suggests that those who undertake the formal study of human beings may end up despising their subject. Finally, it is an artist's challenge to the very idea that mankind may be studied scientifically. Rish is in a better position than most artists to make this call because he is also a practising doctor who specialises in cosmetic surgery. No one could be better acquainted with human insecurities and foibles, or have a more acute understanding of the way appearances influence behaviour. There is a surprising number of doctors who practise art, but Rish is more than an enthusiastic amateur or dilettante. He has used his artistic skills to create a meeting point between cultures. This means working on tapa cloths with islanders in Tonga; on carpets with Turkish weavers; on paintings with indigenous artists from the Kimberley; and on large-scale sculptures with traditionally trained wood carvers in Indonesia. In every country, he has paid his collaborators for their work, over and above the standard rates. This process allows Rish to get under the skin of another culture in a way that can be obtained only by first-hand acquaintance with artworks and the people who make them. It is not a project for a misanthrope, but for someone who has an abiding fascination with the many guises of human nature. It also suits the artist's restless, chameleon-like tendencies to try on different styles and media. Artistically, Rish is the man of a thousand faces, happy to practise one impersonation after another. Yet he does not appropriate imagery, in the manner of Imants Tillers, but creates original, hybrid artefacts. Given the chance to work with master craftsmen in the developing world, many artists would adopt an exaggerated sense of cultural sensitivity, but Rish seems to have taken the opposite approach. In line with his natural irreverence, he is less concerned with trespassing on some local taboo than with falling into the traps of paternalism and patronisation. He has no wish to make a frozen fetish of "authenticity" when all cultures are constantly evolving. Rish reasons that these cultures have survived everything the march of progress can throw at them, so they are robust enough to withstand the intrusions of one interloper from Sydney. His predilection for humour and satire finds its way into a piece such as Prophet Motif (1994) - a Turkish carpet woven to his design by weaver Ayse Can, which features a coloured field of dollar signs and a border of stylised, grasping hands. Chariots (or Webers) of the Gods (1998) is an ochre painting made with Kimberleys artist Lily Karadada, which features a Wandjina figure alongside a barbecue that resembles a flying saucer. The reference is to Erich von Daniken's notorious claim of 1968 that the Wandjinas are portraits of visitors from outer space. Such gags tend to distract us from the deeper value of Rish's collaborations. Beyond the frivolity there is a desire to break down the hierarchies between ''art'' and ''craft'', and to escape the preconception that the work of tribal communities is somehow more ''primitive'' than the works of Western artists. The real target of Rish's humour is the snobbish complacency of his own society. In this show, the most impressive demonstration of the sophistication of non-Western art comes from the large-scale wooden sculptures Rish has created with Balinese carver I Wayan Sumantra. Spirit figures festooned with the trappings of everyday life, they are an uncanny combination of tradition and innovation: temple guardians for a consumer society that treats culture as a commodity that may be bought and sold.